HandShaker is an application available for Windows, Mac, Android and iOS, which facilitates a connection between computers and mobile devices to be able to transfer files easily via a USB cable. After downloading and installing the lightweight tool on a Windows system, it's necessary to download it on your Android or iOS mobile too. If USB debugging is enabled, it's possible for the download and setup operation to be performed by HandShaker automatically. In other words and simply stated, this tool allows you to seamlessly transfer files from Android or iOS devices to your computer using this free application that detects photos, music, videos, downloads and other files. As soon as everything is in place, the program launches the main window, scans the device storage at startup, and shows contents neatly grouped in gallery, music, video, downloads and files categories. The utility has a clean and intuitive interface which adopts a Mac style. In the gallery section, you can check out the thumbnails of all photos saved on your device, open them with an external program via the right-click menu. Or you can copy one or more selected pictures to create files on the hard disk. Images can be also removed from the mobile device, and you can sort the items by week or month. As far as music is concerned, you can check out the name, duration, album and size of each audio track, copy selected songs to Windows, load them in a media player, delete files from the Android or iOS device, as well as change the viewing mode from songs to folders, albums or artists. Similarly, videos can be opened with an external application, saved to the computer or eliminated from the media device to free up space. 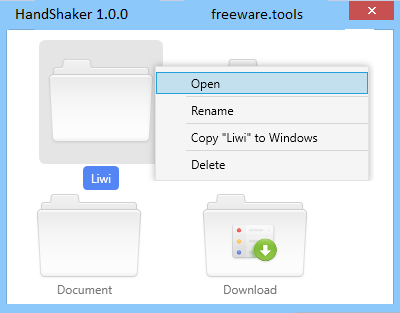 Besides media files, HandShaker provides access to the downloads directory of files and folders, which can be opened, renamed, copied to Windows or deleted, as well as the file structure of the device, where you can explore all stored files and folders, copy, delete or rename them. We encountered some PC-to-Android connectivity issues in our tests that we had to manually resolve, but things worked smoothly after this step. The downside to this tool is that it can only copy files from the portable device to the computer (not the other way around too). HandShaker had minimal impact on the computer's performance and carried out file transfers quickly. It should meet the requirements of users looking for a simple and straightforward way of copying files from their Android or iOS devices to their computers, especially since it's freeware.